There was a time when my late afternoon entertainment meant this cartoon called Cooking Master Boy. This Japanese anime showcased the story of Mao as he goes on a quest around China finding different methods and secrets to perfect his cuisine. In his journey, he met amazing people, some of which bore titles such as Dumpling King or the Prince of Mapo Tofu. Back then, I used to poke fun at the idea of meeting people like these, ‘Iron Chefs’ who are kings and masters of their chosen recipe. Until recently, an amazing experience by Chowking’s doors has shown me that it can happen, there are indeed cooks who become kings of their recipes. A few weeks back, ((Yes, I have a terrible backlog)) I had my Cooking Master Boy experience when I crossed the Beef Noodle King of Taiwan, Chef Liu Zheng Hsiung of the Lao Dong restaurants. One thing interesting about this guy is he won first prize in the Traditional Beef Noodle Competition for his clear soup beef noodle. What is more interesting is Chowking is planning to bring in his epic beef noodles to the Philippines. I can almost see the shining bowls being brought out of Chowking’s counters from Luzon all the way to Mindanao. And I’m not kidding. Chef Liu Zheng Hsiung’s beef bowls are amazing. 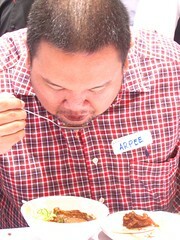 In this event, we were blessed to taste around 3 different bowls. We had a Clear Broth Beef Bowl, a Beef Tendon Bowl, and a Roast Beef Bowl. It was mesmerizing to see smoke rise out of the bowls while it’s being served to you. The scent taunts you to come closer and sink your spoon in for a sip. It was amazing, I say. The flavors were clean and the beef stands out so much so that you can almost taste a good slab of steak in your bowl. I honestly felt like crying when I tasted it. It had an epic flavor of beef in it. 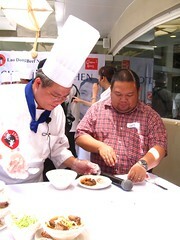 What I found interesting with the invitation was how Chef Liu Zheng Hsiung showed everyone how to serve the beef noodles. 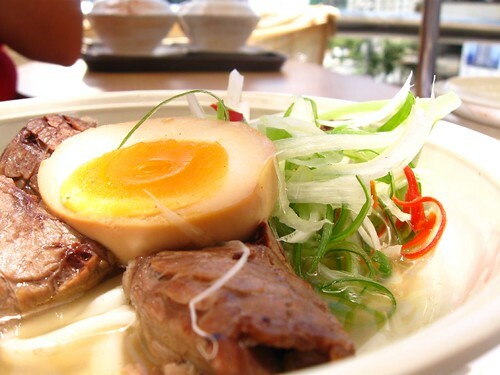 His beef bowl seems to be similar to that of the Japanese ramen, wherein rather than having 1 broth for all his noodles, he actually has a mixture of bases for his broth. 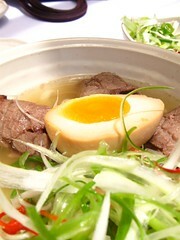 The broth is prepared for 24 hours, boiling beef portions until its essence is on the stock. He pours this mixture unto a fresh noodle and tops it with some chunks of beef tendon, slivers of roast beef, some curly spring onions, and for the clear broth noodles, honeyed tea eggs. ((I will not go on a spiel on these eggs. I have tasted different kinds of tea eggs in my life but not one has come close to this wherein the center was still mushy like century eggs yet still has the amazingly sweet flavor of tea and honey. REALLY! IT’S AMAZING! If someone knows how to do this, tell me!!)). I must say that I’ve never been this excited over fastfood fare in my life. 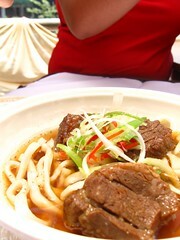 Chef Liu Zheng Hsiung is currently training the Chowking chefs to learn how to make this noodle dish. 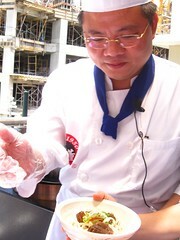 I remember him saying that the secret behind the dish is the heart he places in creating just a bowl of noodle. I wish he also transfers this passion to chefs in Chowking because it’s the kind of noodle that moves the heart and warms the soul. Noodle #2: Lucky Me! Native Chicken Instant Mami! Also, your entry reminded me of this movie called “Tanpopo” by Itami Juzo. Its about a man who does his very best in a bowl of ramen. I never watched it but they say its a masterpiece. What took you so long to have a new post? Thanks for sharing. 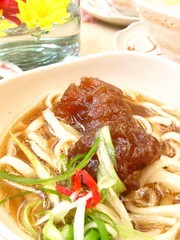 Now I am craving for noodles! Oh, I *hate* you Eskimursten!